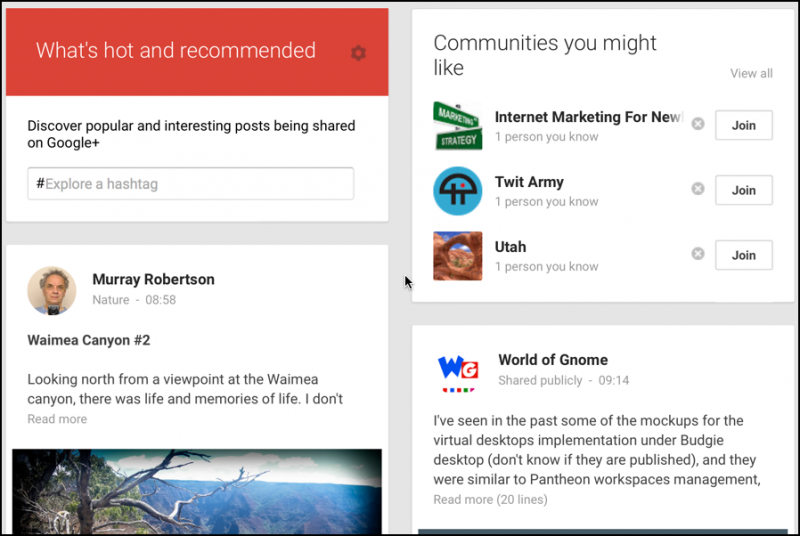 Unlike the mystery algorithm at that other social media site whose name might begin with “F”, Google Plus gives you quite a bit of control over what shows up and how it all lays out, including exactly what you’re talking about, the “What’s Hot” entries. Of course, you might not want to turn it off completely, because What’s Hot does give you an element of content discovery that’s otherwise going to be missing. In other words, you see what your friends post, but how do you ever expand beyond that circle (or set of circles) to stumble into new, unexpected content? Let me show you how to gain control over the What’s Hot content, then you can make your own decision about how much you want to have show up. Works? You can tell it’s “What’s Hot” because it says so — What’s Hot and Recommended — because of the flame icon on the top right and because it’s likely from a page or person you haven’t circled on Google Plus. See the gear icon just to the right of “What’s hot and recommended”, on the red banner? There’s all the control you need. More / Standard / Fewer, all works, and you can uncheck the box “Show posts in Home stream” and remove ’em entirely. And while you’re at it, here I am on Google Plus: Dave Taylor on Google Plus. I invite you to circle me!